Rutin is a glycone form of the flavonol quercetin and it reduces inflammatory pain in animal models. Therapy with granulocyte colony-stimulating factor (G-CSF) is known by the pain caused as its main side effect. The effect of rutin and its mechanisms of action were evaluated in a model of hyperalgesia induced by G-CSF in mice. The mechanical hyperalgesia induced by G-CSF was reduced by treatment with rutin in a dose-dependent manner. Treatment with both rutin + morphine or rutin + indomethacin, at doses that are ineffectual per se, significantly reduced the pain caused by G-CSF. The nitric oxide (NO)–cyclic guanosine monophosphate (cGMP)–protein kinase G (PKG)–ATP-sensitive potassium channel (KATP) signaling pathway activation is one of the analgesic mechanisms of rutin. Rutin also reduced the pro-hyperalgesic and increased anti-hyperalgesic cytokine production induced by G-CSF. Furthermore, rutin inhibited the activation of the nuclear factor kappa-light-chain enhancer of activated B cells (NFκB), which might explain the inhibition of the cytokine production. Treatment with rutin upregulated the decreased mRNA expression of the nuclear factor (erythroid-derived 2)-like 2 (Nrf2) combined with enhancement of the mRNA expression of the Nrf2 downstream target heme oxygenase (HO-1). Intraperitoneal (i.p.) treatment with rutin did not alter the mobilization of neutrophils induced by G-CSF. The analgesia by rutin can be explained by: NO–cGMP–PKG–KATP channel signaling activation, inhibition of NFκB and triggering the Nrf2/HO-1 pathway. 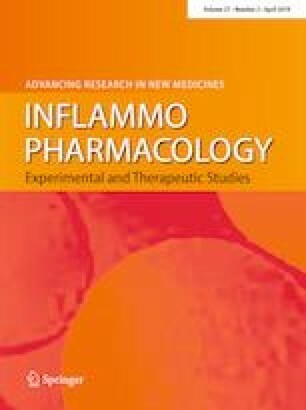 The present study demonstrates rutin as a promising pharmacological approach to treat the pain induced by G-CSF without impairing its primary therapeutic benefit of mobilizing hematopoietic progenitor cells into the blood. RC and WAV contributed with funding acquisition, supervision and study design. TTC, SSM, CRF, MFM, SMB, VF, and CC-C conducted the experiments. TTC, SSM, CRF, MFM, SMB, VF, and CC-C analyzed data. DC-N contributed with funding acquisition, supervision, review and editing. TTC, RC, and WAV wrote the paper. All authors read and approved the final version of the manuscript. This work was supported by Fundo de Apoio ao Ensino Pesquisa e Extensão/Universidade Estadual de Londrina [FAEPE/UEL 01/2009], Coordenação de Aperfeiçoamento de Pessoal de Nível Superior—Brasil (CAPES)—[Finance Code 001], Conselho Nacional de Desenvolvimento Científico e Tecnológico (CNPq-Brazil), Ministério da Ciência, Tecnologia e Inovação (MCTI), Secretaria da Ciência, Tecnologia e Ensino Superior (SETI), Fundação Araucária and Governo do Estado do Paraná. SMB received a post-doctoral fellowship [CNPq process: 435357/2016-6]. Animal care and manipulation were carried out following the experimental guidelines from the International Association for Study of Pain (IASP), EU Directive 2010/63/EU, and the Brazilian Council on Animal Experimentation (CONCEA). All experiments with animals in the present study were conducted according to the protocols approved by the process registered under the number 11654.2015.81, dated from October 8th, 2015 of the Ethics Committee on Animal Use of the State University of Londrina (CEUA-UEL).